It was a late January Sunday afternoon. 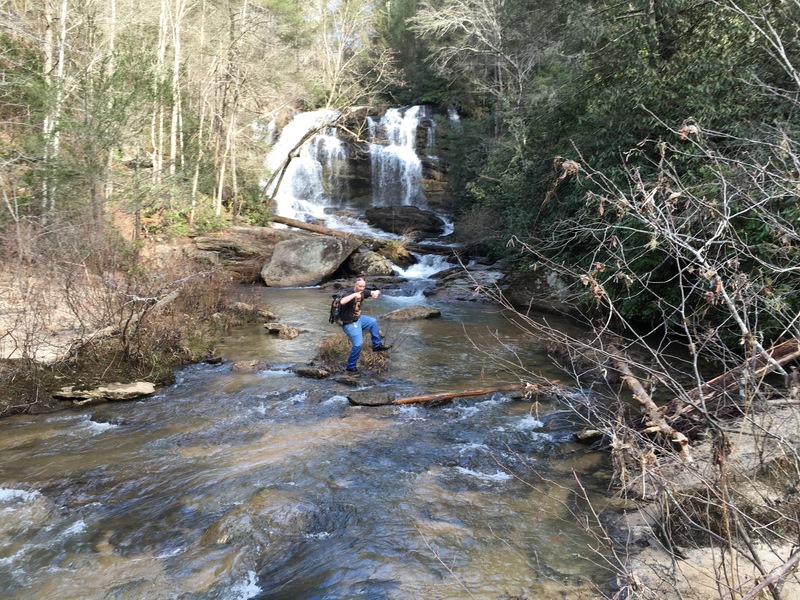 We had just spent 1-2 hours exploring each waterfall at Brasstown Falls. It had already been a great day, and a great weekend as well. 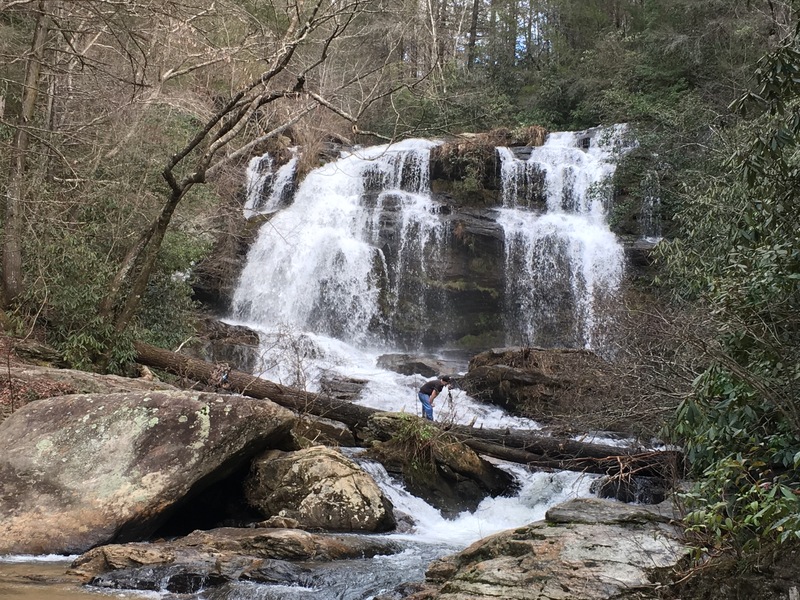 I had spent time the previous day in NE Georgia seeing waterfalls, and had seen some waterfalls the same day before Brasstown. I could have left for home and been fine…..but that is just not how we roll. I always try to squeeze in as many waterfalls as possible per trip and usually the hard part is deciding which ones NOT to visit and to save for a later day. 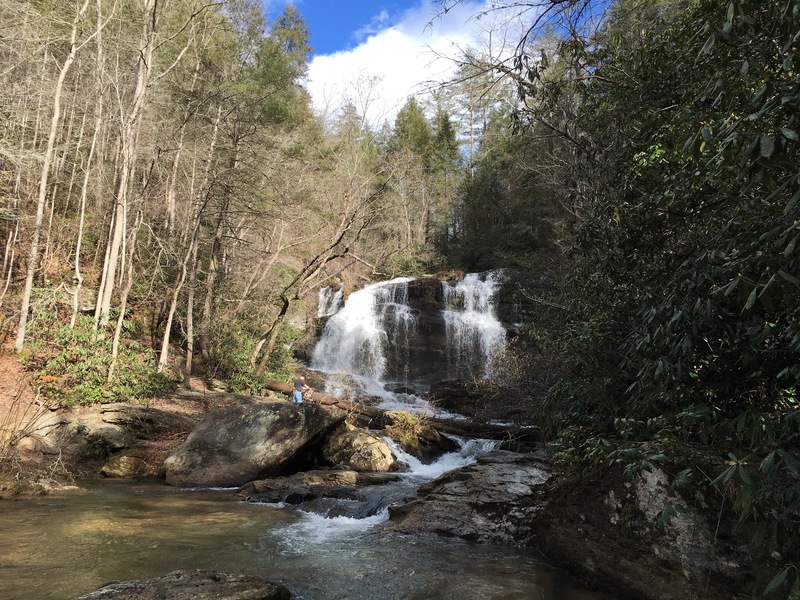 After Brasstown Falls, we had a short meeting of the waterfall minds. Sids Falls was very close by, but most of us had just recently visited this one. Daniel had this thing for Kings Creek Falls, which is beautiful and a must-see…but being probably an hour away was just not practical. 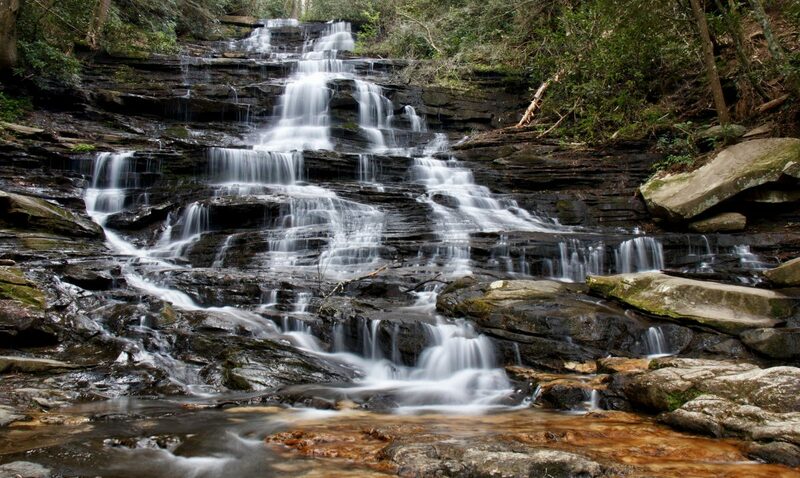 It really came down to 2 waterfalls, that were just moments away: Opossum Creek Falls or Long Creek Falls. They were both very close by. The trailheads were maybe 1 mile apart on the dirt Turkey Ridge Rd. 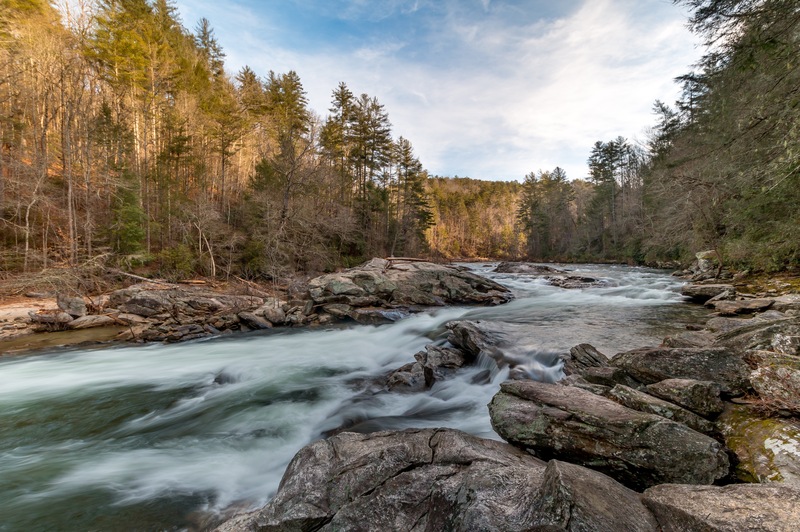 They were also both on the Carolina Mountain Club’s Waterfall Challenge 100 (WC100) that I have been working on for several years and had yet to see. 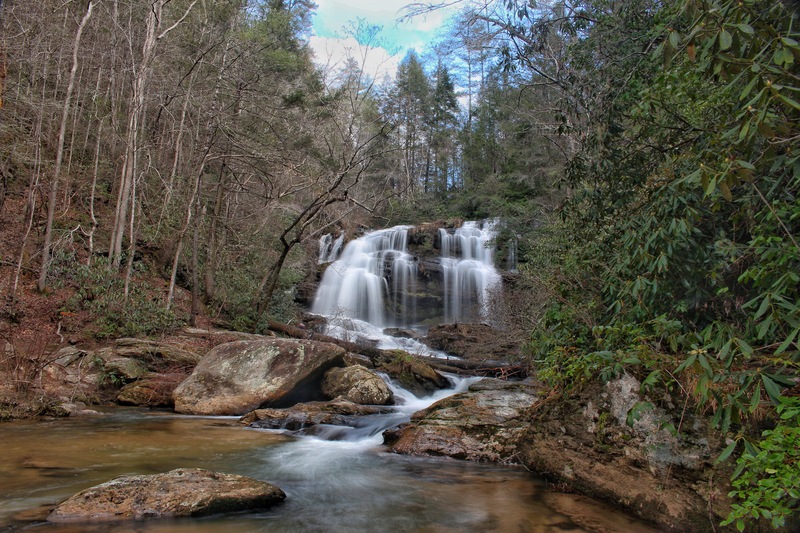 One person in the group had been to these before and warned that Opossum Creek Falls was over 5 miles round trip while Long Creek Falls was around 3 miles round trip. 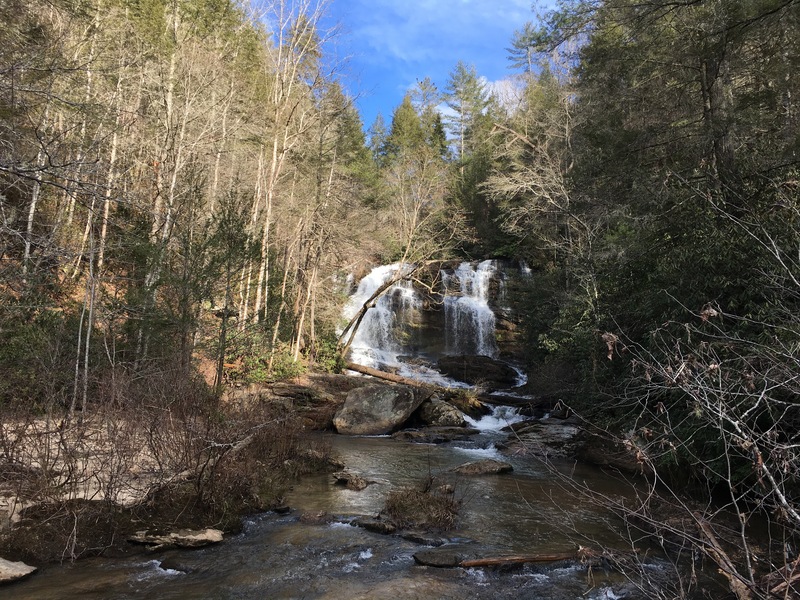 Being Sunday afternoon now, and long drives home awaiting everyone, we opted for the shorter Long Creek Falls. It turned out to be a very good choice. It was about now that I am realizing that this area in far western SC, just miles from the Georgia state line is a true waterfall hotspot. 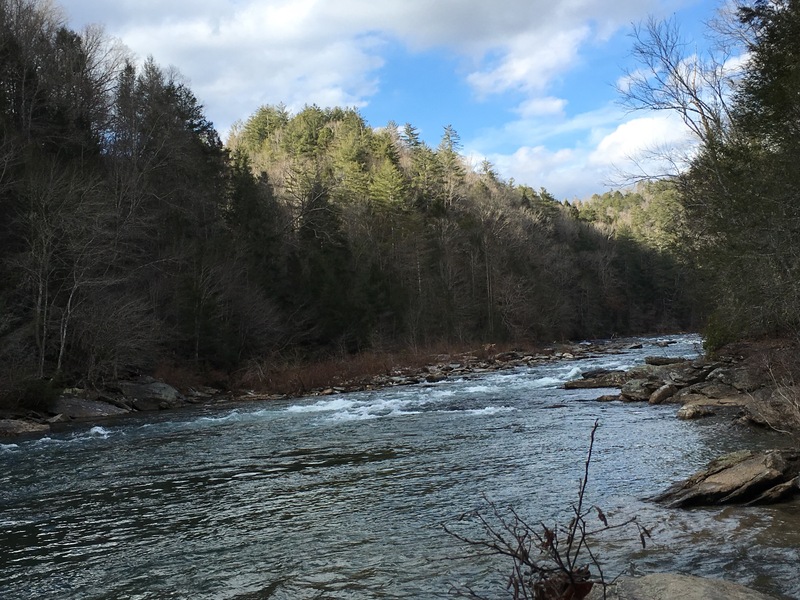 As the Chattooga River divides South Carolina and Georgia, it cuts through some fairly steep terrain. 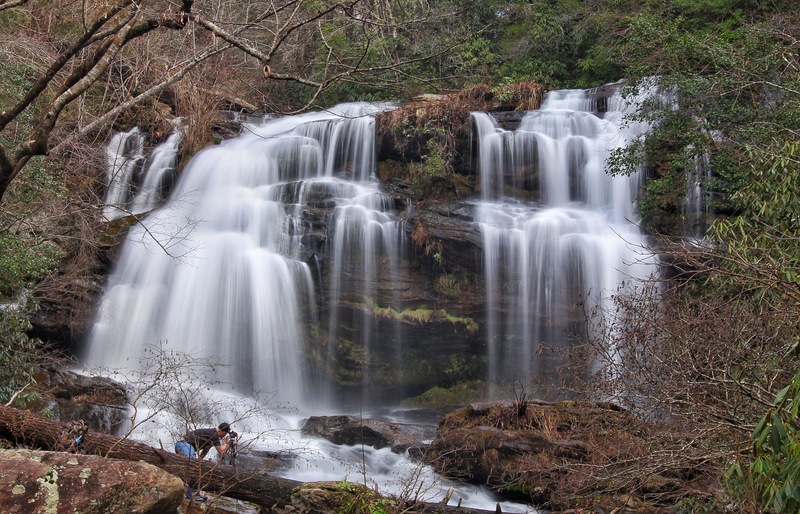 Just about every creek draining on the South Carolina side seems to have some very notable and beautiful waterfalls on it. What a great find! 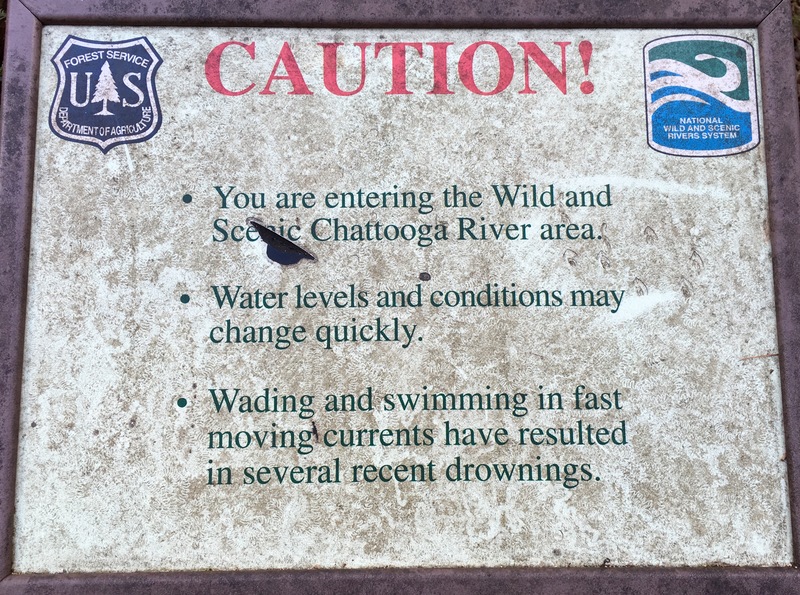 Speaking of the Chatooga River, we crossed it on US 76 coming in from Georgia, and stopped at the state line. There is a short trail there that leads to a very scenic class V rapid named Bull Sluice, that is popular with the paddlers. It looked very good just after sunrise. 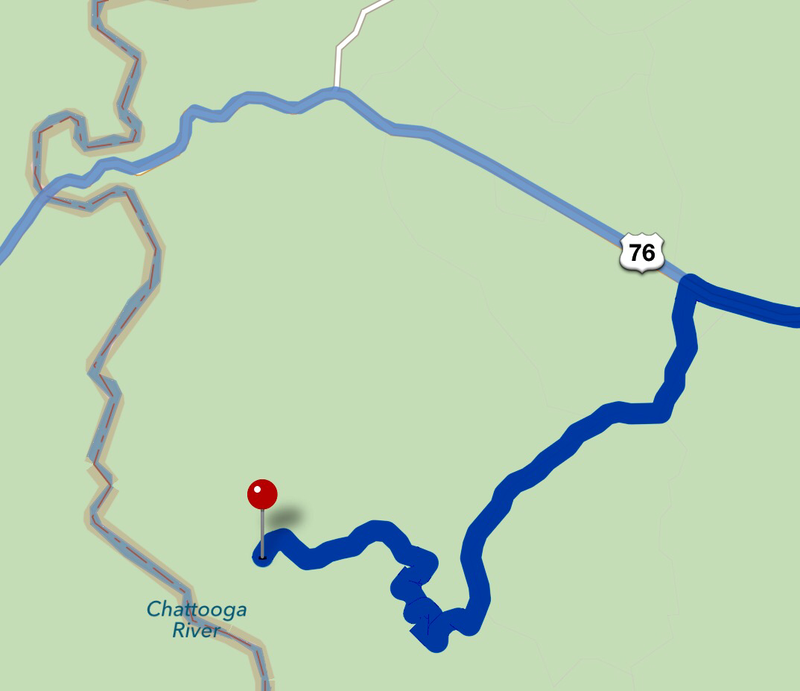 To get here, find your way onto US 76, also called Long Creek Highway. If you are heading east from Georgia as we were, look for a road on the right called Damascus Church Rd. Turn right or left here depending on which way you are coming from. Follow this for about a mile and turn left onto Battlecreek Rd. Take this for 1.8 miles and bear right onto a dirt road called Shoulderbone Rd. 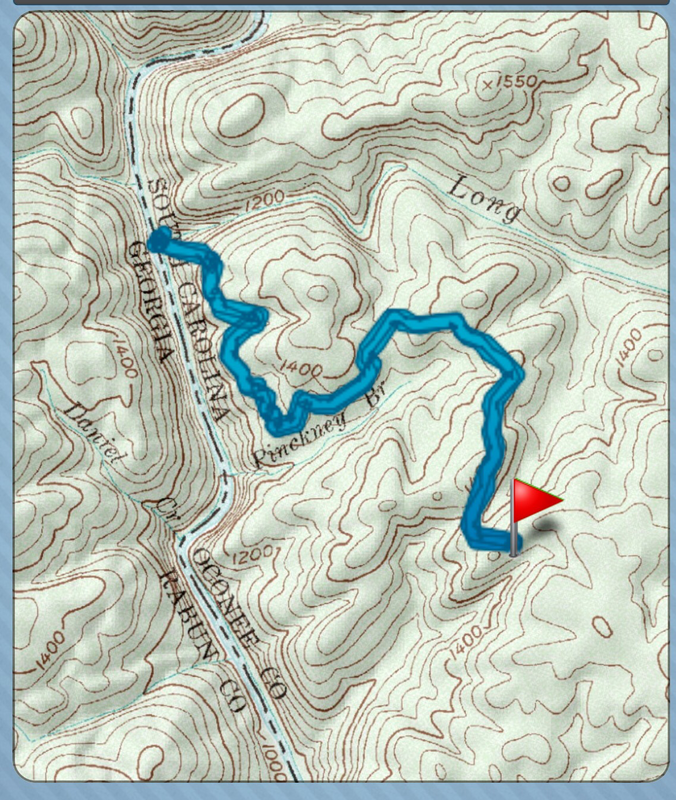 This is just a short connector to Turkey Ridge Rd which you will then take a right on and follow the twisting, narrow dirt road for 3 miles back into the Deep South Carolina wilderness, until the road ends at an open parking area. About halfway, we passed another trailhead, that turned out to be the trailhead for Opossum Creek Falls…good info for me to know. Once parked,the trail is the primitive forest road seen leading into the woods to the right. It was said that the first 1.5 miles of this 1.6 mile hike were easy to moderate, and I agreed mostly with this. At 1/4 mile in, the road, which seems like it might be passable (but definitely is not) comes to a fork. 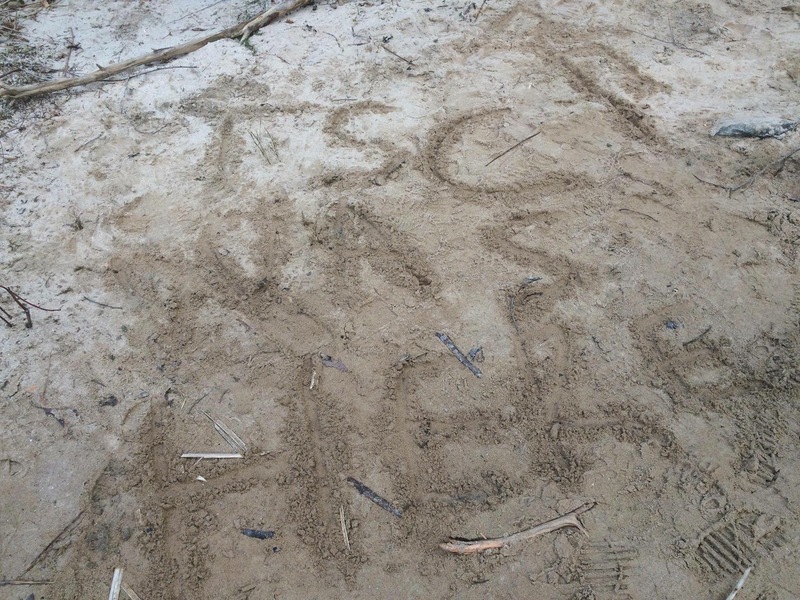 To get to Long Creek Falls, stay RIGHT here. I am not sure where going left will take you. A little further up, the road seems to end and it becomes more of a path/old logging road type of trail. This sign will be on the trail about this point to mark it. The short climb back up will get you huffing and puffing a bit, then the return hike was pleasant.